Cargo containers at the docks of Shenzhen, China. Photo courtesy of Shutterstock. My favorite map looks different. It puts China, not the Atlantic, at the center of the world. That reflects reality. In 2014, China became the largest economy on the planet, if you calculate Gross Domestic Product (GDP) in purchasing-power parities: in other words, by measuring the production of final goods and services with a common system of international prices. China’s new role as global superpower was celebrated with little fanfare. But in my opinion it’s the source of many of the global economy’s recent shifts and shocks. My favorite way to explain the current situation is that we’re witnessing a collective silent scream on behalf of the West in response to the loss of its worldwide dominion. If you want to understand why, just look at my map. With China in the center, Europe is moved to the periphery. The relevant oceans become the Pacific and the Indian, from which China’s growth radiates out. China’s contribution to world growth increased from 3 percent in 1970 to 31 percent in 2015. That growth is rolling across South Asia and East Africa. It’s also noteworthy that the Pacific countries in Latin America are doing better than the Atlantic countries there. The transition may feel especially jarring because, since World War II, we have been living through a period in human history that is extraordinary in its absence of violent global conflict. That relative peace has allowed much of the world to concentrate on growth, technology, innovation, prosperity, and energy. This period has also given space for economies around the world, and especially those in Asia, to catch up with Western countries. Just look at how Korea, Singapore, Japan, and other Asian nations have achieved a rapid, unprecedented catch-up with the United States in terms of GDP per capita. China illustrates the extraordinary scale of the catch-up, as well as how much progress there has been. Back in the 1950s, China had less than 5 percent of the per capita income of the United States. Today that number has increased to 25 percent. That lags well behind Korea and Japan, which are both at 80 percent, but the scale and speed of China’s ascent is big enough to make us rethink the geography of the world. As China leverages its size going forward, it will become more and more a source of global growth. 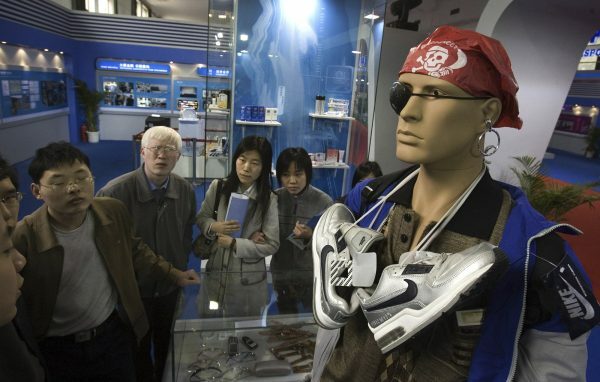 Visitors walk past a mannequin set up to show how individuals attempt to get past customs, smuggling counterfeit products in violation of intellectual property rights law during an exhibition in Beijing, April 17, 2006. Photo by Ng Han Guan/Associated Press. So much change, of course, is unsettling. And when things are unsettled, international trade often gets jostled, because trade is such a delicate thing. Trade requires both a complicated mix of public sector and private sector activities. 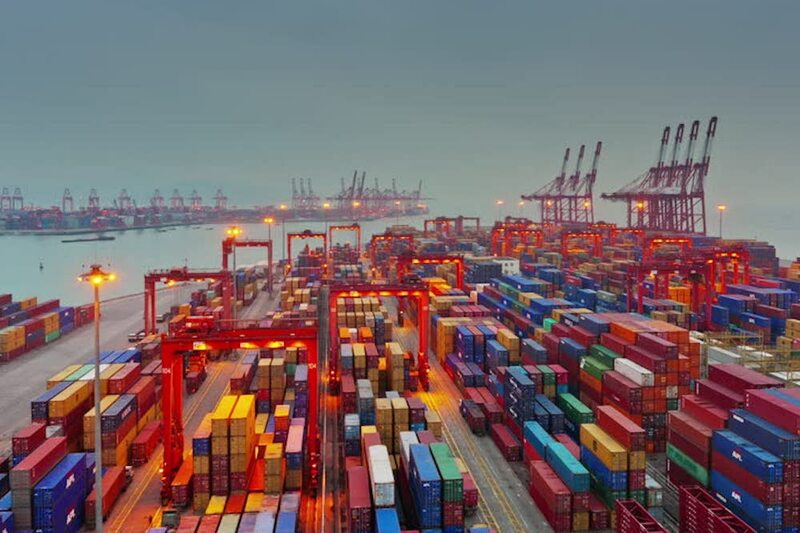 And trade is politically perilous because trade comes with unavoidable imbalances; it leaves the whole richer off, but there are winners and losers, and it doesn’t lift all boats at the same time. Some of the biggest, most obvious losers are manufacturing workers who are undercut by lower-wage competitors. And if you are working in heavy manufacturing and you’re not computer literate, you may be unemployable until you die. And if you’re such a person and you live in a country without a strong safety net, you may have little to protect you. The Great Recession, and the anti-trade backlash that has followed, are a painful reminder of trade’s fragility. And of this hard fact: While we have global trade, we don’t really have global governance. That means governments can’t easily respond to this anti-trade, protectionist wave, at least quickly. The lack of political response to unsettling change conspires to make groups of people become desperate or hopeless, to lose faith, and to lash out. It’s very easy for smart, populist politicians to pick up on this, and gain votes and power by blaming trade or immigration, or by appealing to that ultimate trump card, national security. The response we are seeing in many places is the re-institution of controls on trade and global exchange, despite the costs. Such controls aren’t new. The biggest came after the Sept. 11, 2001 attacks, with tight new screening measures in airports, and the time and money that this wastes. What is the best response to this backlash and these controls? For me, that question reminds me of a saying we have in Spanish (I’m originally from Madrid) that translates as: “You kill the dog, no more rabies.” You want to find ways to get rid of the rabies—or, to unpack the metaphor, the disease of unsettling change under globalization—without killing the dog. One approach is to defend free trade directly, since we economists understand that trade is not a zero-sum game; rather, it’s a positive game, with winners who could compensate the losers. Still, as an economist trained in free trade and the research on it, I’ve begun to rethink whether we need a more robust response that would mean profound changes for Americans. A saying we have in Spanish … translates as: “You kill the dog, no more rabies.” You want to find ways to get rid of the rabies—or, to unpack the metaphor, the disease of unsettling change under globalization—without killing the dog. This moment requires some hard questions and rethinking. How well does free trade really fit with the other things we want in modern societies? I was just re-reading work on globalization from an economist colleague, Dani Rodrik, at Harvard. And he says you cannot have all three of the following things simultaneously: democracy, national sovereignty, and free trade. For example, you cannot have international trade without some international rules, and those rules have to be enforced by somebody with international power. So if you want a globally integrated world, you have to give up some sovereignty. Or you have to go the Chinese way and forget about democracy. You have trade and national sovereignty, but capital controls and top-down management. The theory here, extended to Western liberal democracies, is that you don’t give the electorate a say in economic policy because they’ll support Le Pen or Brexit or Trump. I’m also not sure I’ve fully taken into account the risks of globalization and trade. Look at the recession of 2008; the risks are pretty high that something like this will happen again. A more economically integrated world would transmit any shocks that happen anywhere on the planet, and that could produce havoc. It’s clear that putting up walls, trade barriers, and restrictions will not solve a more fundamental problem here in the United States: that the country has too little savings relative to investment, and that this gap needs to be financed from abroad, and this requires a current account deficit. Perhaps this idea is not easy to understand, but it is an accounting and an economic truth. I also find myself thinking of the Nobel Laureate Paul Samuelson, and the famous challenge he was issued by the mathematician Stanislaw Ulam to “name me one proposition in all of the social sciences which is both true and non-trivial.” Samuelson eventually answered by citing the concept of comparative advantage, the idea that gains from trade follow from allowing economies to specialize. If one country’s economy is better at making computers than coffee, it makes sense for it to invest more in computers and export them, to be able to afford to purchase coffee from some other country. Samuelson was right, but the problem is that too many people, including many in power, don’t understand the concept. And they don’t understand that even if the United States tried to fix its trade imbalance with China, there would be a backlash, retaliation, and the demise of thousands of companies and jobs. What we need is to adjust to the world as it is, not to the old maps on the wall, with the Atlantic Ocean at the center. We must recognize the value of trade, and do more for the losers. And we must reckon with the reality of China’s ascendancy and the increasing role that machines will play in our lives. Javier Díaz-Giménez is a Professor of Economics at IESE Business School, currently visiting UCLA Anderson School of Management.